Barnes & Noble College will be participating in the second annual celebration of National Student Day on Oct. 4. Sponsored by the National Association of College Stores (NACS), National Student Day celebrates and promotes social responsibility by college students. With the addition of Barnes & Noble College, more than 1,500 college stores across North America are participating in the event, with many more expected to join as National Student Day draws near. That’s nearly triple the number of stores that took part in last year’s inaugural event. All Barnes & Noble College stores will be participating in National Student Day by hosting a Flash Sale in all bookstores and sponsoring a Pinterest Scavenger Hunt. Students who unscramble a secret word on Pinterest will get the chance to win a $300 gift card or an Alta Gracia prize pack. As part of a national contest sponsored by NACS, students also have the opportunity to win prizes for the most popular socially responsible idea and example of volunteerism. 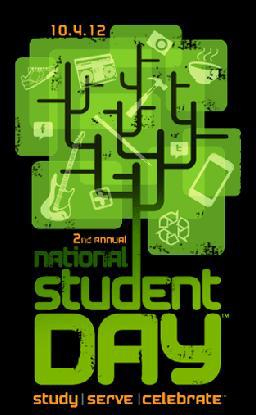 Participants can register at nationalstudentday.com and post an example of how they like to give back to their community in the form of a text, photo, drawing, or video. Students can then spread the word via YouTube, Facebook, and Twitter to capture the most votes among their friends and win! The ten most popular examples of student volunteerism will win prizes ranging from an Apple iPad to a $3,000 scholarship. For more information, visit nationalstudentday.com.